ON Semiconductor has combined with RFMicron, and developed a game-changing ‘plug-and-play’ development tool to speed the deployment of wireless passive sensor solutions onto any Internet of Things (IoT) cloud platform. The IoT Platform Development Kit, SENSORRFGEVK, brings together a series of performance-optimized computing and connectivity modules to facilitate quick and effective deployment of battery-free wireless sensing technology and IoT hardware in locations where power and space constraints are of particular concern. This streamlined and flexible solution takes the approach of moving much of the system's intelligence away from where the sensors are situated, and placing it on the cloud. Each IoT Platform Development Kit incorporates ON Semiconductor's battery-free wireless sensor tags, which use RFMicron's Magnus® S2 Sensor IC, and can perform temperature, moisture, pressure, or proximity sensing functions. The platform also features a UHF RFID reader module with 32 decibels-milliwatt (dBm) power rating and an 860 megahertz (MHz) to 960 MHz frequency range. Localized data processing is performed by the ARM® Cortex-A8 based AM335x system-on-chip (SoC). The platform has the capacity to transfer captured data either wirelessly (via WLAN, Zigbee, Z-Wave, UHF Gen 2, etc.) or using wireline infrastructure (via KNX, CAN, SPI, Ethernet. etc.). 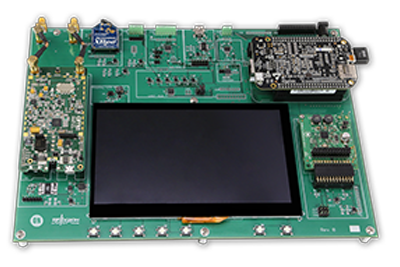 This development kit complements ON Semiconductor's existing wireless sensor evaluation kit, SPS1M-EVK, which provides a set of tools test our sensor capabilities. The platform also possesses an intuitive touch-enabled user interface, plus LEDs, headers and switches designed to enhance its configurability and expand its operational potential. The sophisticated accompanying software allows the platform to fit seamless into any supported network, serving as a dedicated node. Built-in application firmware will assist engineers in implementing more effective IoT-based data-acquisition/monitoring systems irrespective of their experience level. The combination of all the functions above in a single self-contained board creates an integration tool IoT platforms can use to easily evaluate wireless sensing technology in their ecosystems.